So we have discovered that Honda has updated the little adapter your H7 headlight bulb plugs into. The one on the left in the picture is a brand new, unused old style. The one in the center is a burned up unit. Notice the discoloration of the left terminal. The customer was commenting that his bulb would work on occasion. This is actually a common occurrence for those that have not transitioned to LED. The adapter on the right is the updated unit. Notice it has a brace going between the two terminals. This is to stop vibration. This vibration can cause the bulb to make short, intermittent contact. 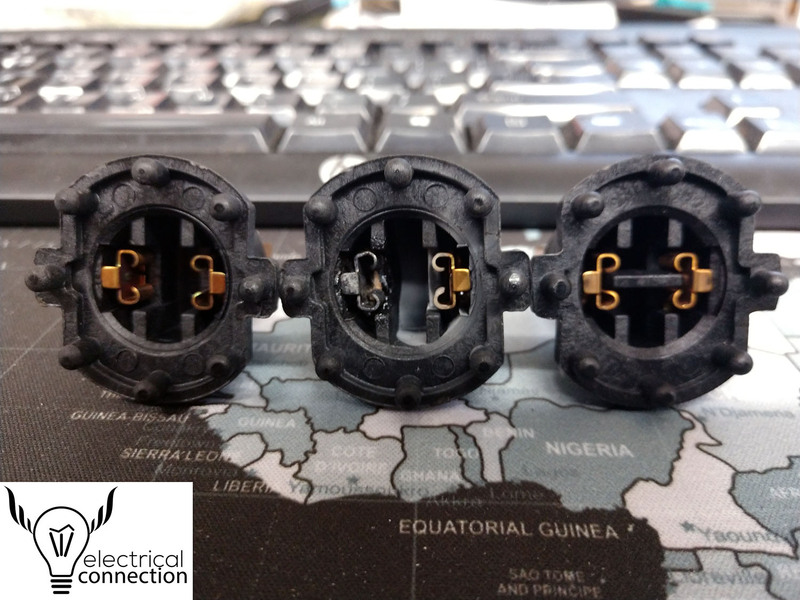 This break in contact causes the terminals to heat up and cause the damage as shown on the left adapter. The terminals themselves also appear to be thicker and more robust. If you find yourself replacing your adapter, make sure it has the brace between the 2 terminals. This should greatly help with the longevity of your adapters. ← 2018 Honda Goldwing. Not Plug & Play.